Speleotherapy treatment was first formulated by Polish physician F.Bochkowsky in 1843, and has considerable widespread use in some Central and Eastern European countries. Halotherapy (from the Greek word “halos” meaning salt), is a natural therapy that uses Speleotherapy’s main healing factor – an environment saturated with dry sodium chloride aerosol. Halotherapy medical technology was developed in Russia in 1989. Speleotherapy and halotherapy are used for the treatment of respiratory conditions. Treatment occurs in a controlled air medium that simulates a natural salt cave microclimate. Natural dry sodium chloride aerosol, formed by convective diffusion from salt walls, is the major curative factor of the salt caves or mines, as well as a comfortable temperature and humidity regime and the hypo-bacterial and allergen-free air environment saturated with aero ions – all enhance the therapeutic effect. Salt caves or mines are known to be used for therapeutic purposes in countries like Austria (Solzbad-Salzeman), Romania (Praid), Poland (Wieliczka), Azerbaijan (Nakhichevan), Kirgizia (Chon-Tous), the Ukraine: Solotvino, (Carpathians), Artiomovsk (Donietsk region) and Russia, among others. A speleotherapy clinic was established in Toronto in 2001. Speleotherapy is essentially a treatment of ailments using the air in underground caves and mines. 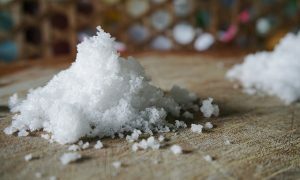 Such air is typically rich in natural salt microns and ions, which have been found quite effective in reducing asthma, allergies, and other breathing problems. Skin conditions such as psoriasis, rashes, eczema, acne can be improved with this therapy. Table salt, sodium chloride, is dehydrating, but pure mineral salts have natural moisturizing properties and support the skin’s water balance and barrier function by attracting moisture to the skin. Minerals are necessary for cell function and detoxification, so mineral salts have strong rejuvenating properties. Is Salt Cave Therapy Worth its Salt? Speleotherapy and halotherapy are used for the treatment of respiratory conditions through an environment saturated with dry sodium chloride aerosol, usually salt mines. Speleotherapy and halotherapy are treatments that involve breathing salty air. Speleotherapy and halotherapy have been known to treat asthma, chronic bronchitis, and allergies. Salt is also extremely beneficial to your skin in treating acne, psoriasis, neurodermatitis and eczema.